Great Moments In Pop: The REM Story (4 minutes, 1.0 MB): Includes the classic ballad 'Everybody Burps'. N.B. The original sketches bear little relation to the daytime quiz of the same name. The Bedsit Survival Guide: Bathtime (2 minutes, 0.5 MB): An installment from this invaluable series. Warning: contains spiders! Throwing Muses Interview (4 minutes, 0.9 MB): Mark gives us a masterclass in professional interview technique. Singer/Guitarist Kristin Hersh giggles a lot. This will probably be the last update of this site. However, I will continue to exchange CDs of mp3 clips with fans(click here to get in touch). I now have approx 40 hours of material(! ), at much higher bitrates than the clips here (they were compressed to fit on the site). Especially wanted: material from the first year of the show and Drugstore live in session. Hey, if you're here I presume you know what the Graveyard Shift was! If not then check out the excellent Unofficial Mark Radcliffe Site (this link is to an archive copy of the original site which is AWOL). 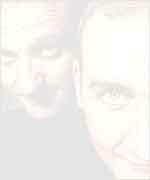 Mark and Lard presented this show between October 1993 and Febuary 1997. It was a mixture of records (no playlist! ), comedy items and rambling chat. It was great, and the 10 to midnight slot meant the duo could basically do whatever they felt like, a far cry from the restrictions placed on their current daytime show. The idea of this page is to provide some mp3 downloads from this classic show. I don't know the dates for all the clips, but where not stated they are probably later in the series, circa 1995/96. Click your right mouse button over the title and choose "save target as" to download the files. Creepers Ban (3 minutes, 0.6 MB): How come Mark Riley's legendary pop combo never get played on Radio 1? Lard suspects a Status Quo style ban. Graveyard Shift Vs Evening Session (2 minutes, 0.3 MB): Which was best? And here's some more: Mr Methane Performs Another Carol Medley (3 min, 0.7MB). Wheel Of Misfortune (7 minutes, 1.5 MB): Lauren Laverne takes part in this quiz (which is totally different to Circle Of Chance). Can she beat the scores of her band mates in Kenickie? Lard Dancing (4 minutes, 0.9 MB): Why is Lard dancing around the studio? Maybe a newsflash about teen pop sensations Take That will explain things. Blackmail Corner: "Common People" by Pulp (4 minutes, 0.9 MB): Mark has found out that this hit single sounds suspiciously similar to an obscure Spanish disco track. But is Jarvis Cocker prepared to pay to keep him quiet? Is that all there is?! Sorry, I don't have any more spare web space right now. 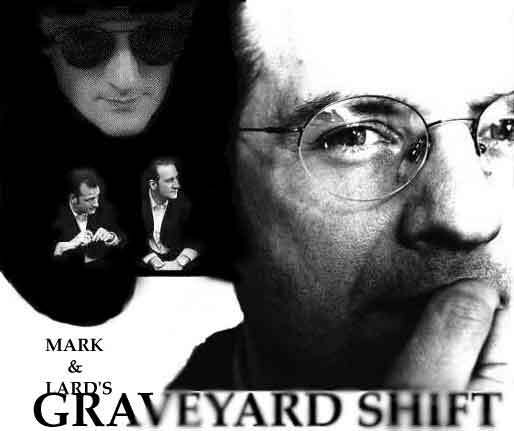 Do you have any Graveyard Shift material to contribute? Someone somewhere must have converted a load of these shows to mp3. I've got quite a bit of Mark and Lard stuff I could swap for it (plus other comedy stuff related to the links below). I now have several CDs with approx. 40 hours of Graveshift Shift! BBC Radio 6 - Digital station also known as 6 Music. Lard's new home. Resonance FM - Stewart Lee does a show some Sunday afternoons (12-2pm). A great show, very much in the Graveyard Shift style. The station is London only, but you can listen on the web. If you have any shows on mp3 then get in touch!